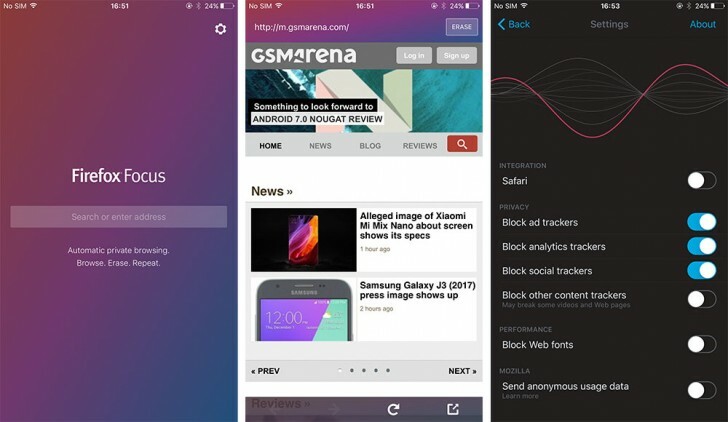 Firefox recently launched its all new Firefox Focus browser for iOS which comes with fast and easy private browsing and other features. Read on to know more. Firefox Focus is a free and fast private browser from Firefox for the Apple iOS users. The all new Firefox browser is fully loaded with features. The best part is the private browsing that is offered by the browser for all those who like to have privacy in the day-to-day life. Firefox Focus is by default set to block any kind of online trackers, and you don’t have to change any privacy or cookie setting if you are looking for privacy browsing. And not just that, you can erase all the browsing history with a single tap. Apart from the ability to knock of history, you can also erase cookies as well as passwords. You will be having much faster browsing, as the browser will be blocking any online trackers by which you will have ads free site that will load much faster. Firefox Focus comes with Yahoo search bar by default at the top. Firefox browsing app is currently available at the app store with its latest update as of November 17, 2016, version. It is compatible with almost all the devices that are running iOS 9.0 or later version. The new browsing app is compatible with both iPhones and iPads. Just to give you an idea of which iPhone models this app supports, here is are the model names: the iPhone 5s, the iPhone 6/6 Plus, the iPhone 6s/6s Plus, the iPhone SE as well as the latest iPhone 7 and the iPhone 7 Plus. You can use the new Firefox Focus browsing app with iPad Air, the iPad Air Wi-Fi + Cellular and range of other models as well. To know more about the models, please visit the link source below. And don’t forget to put in your views to share your experience with the new browsing app. This new firefox focus seems a lot promising to the apple uses hope they will launch something same for PCs too.